Achilles tendinosis occurs when the achilles tendon degenerates and becomes inflamed. The tendon can swell and may cause pain. This condition is common in athletes, runners and patients who have calf tightness. Achilles tendinosis may occur in the middle of the tendon. This is known as midsubstance achilles tendinosis. It may also occur at the point where the tendon connects to the heel bone. This is known as insertional achilles tendinosis. Achilles and calf tightness is a common cause of achilles tendinosis. 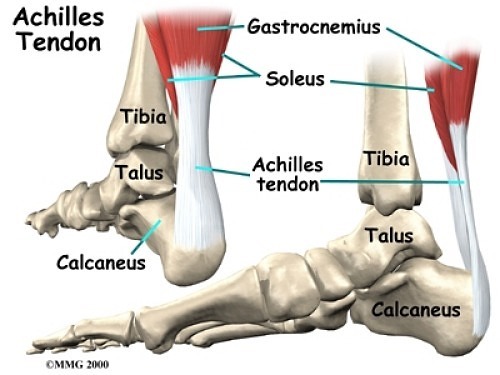 In addition, insertional achilles tendinosis is often associated with a heel bone spur. This spur may rub against the achilles tendon and lead to breakdown and small tears. It is similar to a rope being rubbed against a sharp rock. This is also known as 'Haglund’s Syndrome'. Pain and swelling occur as the cumulative effects of chronic wear and tear on the tendon. How is achilles tendinosis diagnosed? Treatment depends on the length and severity of the symptoms, with many patients improving without surgery. However, in some cases, a referral for surgery may be required. The specifics of the surgery depend upon the location and extent of the tendinosis. Heel cups to try and improve pain by taking some of the stress off of the Achilles tendon when walking. Activity/​work modifications; adequate sleep; rest and time. If I am treated without surgery for achilles tendinosis will it come back? - While most patients will achieve lasting relief after treatment for achilles tendinosis, symptoms may return. The risk decreases if the patient continues to do routine stretching even after the symptoms resolve. However, athletes and runners in particular are at a slightly higher risk for this condition because of the high demands on the achilles. These patients should pay close attention to stretching and shoe-wear to prevent chronic recurrence. What are the outcomes for those who have surgery for achilles tendinosis? - Surgery can predictably return patients to activity. Success rates have been reported between 80 and 90 percent, which means that eight to nine out of 10 people improve with surgery. Some of the variability depends on the amount of tendon that is diseased at the time of surgery. Patients improve with both conservative and operative management of achilles tendinosis. Physical therapy has been shown to help most patients with this condition and should be tried before surgical management is proposed. Achilles tendon injuries can be successfully rehabilitated conservatively with hands-on treatment. Steroid injections and casting are seldom used these days. Once the local inflammation has been controlled, improved blood flow to the region of relative avascularity is necessary. Chiropractic joint mobilization techniques, correct stretching and strengthening exercises can be demonstrated and monitored in Dr. Pisarek's office. One of the most important long-term goals is to reduce any tendency to pronate excessively. In addition to custom-made orthotics (Footmaxx) , all runners should be encouraged to wear well-designed shoes that provide good heel stability with a small amount of additional heel lift. This helps prevent achilles tendon problems, and is especially important in athletes who run more than a few miles at a time. Prevention of achilles tendonitis can be achieved with slowly increasing activity, purchasing quality foot wear, stretching, and cross-training. People who have had a history of achilles problems need to be conservative with their exercise and training programs. Big problems and injuries to the achilles tendon occur most commonly after ignoring small problems and pains. Pain is a warning sign something is wrong. Ignoring the problem often creates a more extensive injury. Prevent small achilles injuries from becoming large injuries that require more time and treatment to correct by calling Dr. Pisarek today at (416) 633-3000.